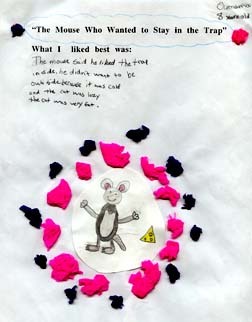 Below are examples of what some of our young readers had to say about the Mouse Who Wanted to Stay in the Trap. 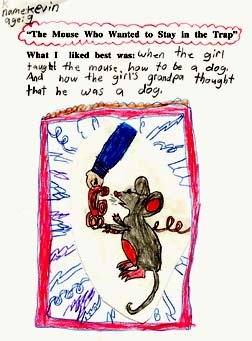 Kevin, age nine, wrote, "What I liked best was when the girl taught the mouse how to be a dog. And how the girl's grandpa thought that he was a dog." Oumama, age eight. 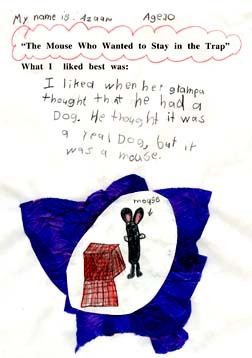 wrote, "What I liked best was when the mouse said he liked the trap inside. He didn't want to be outside because it was cold and the cat was lazy. The cat was very fat." 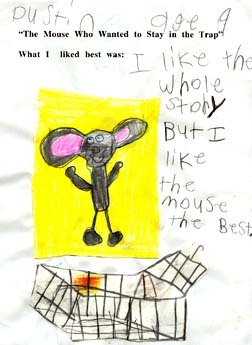 Dustin, age nine, wrote, "I like the whole story but I like the mouse the best." 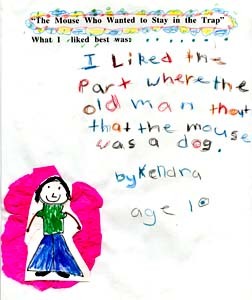 Kendra, age ten, wrote, "I liked the part where the old man thought that the mouse was a dog." 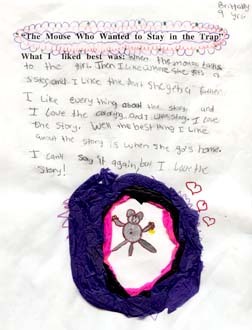 Brittany, age nine, wrote, "What I liked best was when the mouse talks to the girl. Then I like where she gets a sister, and I like the part she gets a father. I like everything about the story and I love the coloring and a little story. I love the story. The best thing I like about the story is when she goes home. I can't say it again, but I love the story." Azaam, age ten, wrote, "I liked when her grampa thought that he had a dog. He thought it was a real dog, but it was a mouse." 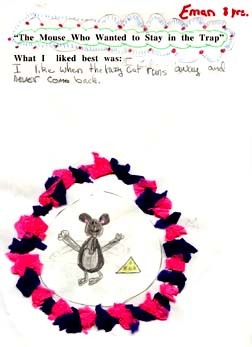 Eman, age eight, wrote, "I like when the lazy cat runs away and never comes back." Thank you to all of the children who sent me their beautiful, imaginative reviews. I would display them all if I had the space.